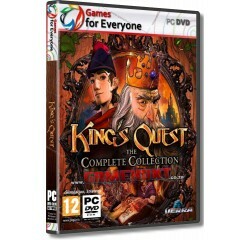 King's Quest - The Complete Collection - 2 Disk - R160,00 : Game Hunt, Where we lead, others follow. King's Quest is a collection of five different chapter releases, each focusing on an untold tale in Graham's past. In each chapter, an aging King Graham reflects on his life of adventure with his granddaughter, Gwendolyn. Select between the noble pillars of Bravery, Wisdom, and Compassion to see what rippling effects these choices will have on Graham's journey as well as later chapters. Processor - 2.0 GHz Core 2 Duo® or equivalent AMD® processor.